With the rising temperatures and forecasted rain this week, we will be checking frost levels throughout the county. 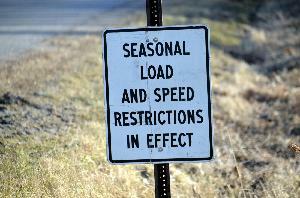 As of today, Monday, April 22, 2019, frost laws, or seasonal weight restrictions, remain in effect for the entirety of Kalkaska County Road Commission roads. We will update our Facebook page and webpage as we have an update. Beginning at 6:00am, Wednesday, March 13, 2019, Frost Laws or Seasonal Weight Restrictions WILL BE IN EFFECT for the entirety of Kalkaska County. April 19, 1871 was Kalkaska County's first recorded record of any highways constructed in the County. All roads constructed during the early period of the county were maintained by the separate townships by levying a road tax and electing a Township Highway Commissioner. The townships constructed and maintained their own roads. Work on the roads was performed by horses, wagons, wheel scrapers, and lots of hand work. During the winter months, some townships rolled the roads and packed the snow down with a large wooden or steel roller pulled by teams of horses. While this method was good as long as the snow stayed frozen, springtime thaw made it hard to travel the roads as the horses would break through the soft snow, leaving holes that would freeze in the night. While there were only a few miles of County Roads in early 1896, the roads were constructed of gravel, cinders, crushed stone or slag. Stone was processed into road material by a stationary crusher and cinders and slag were purchased from the Antrim Iron Company of Mancelona. By the end of 1920 or early 1930’s, most of the township roads were incorporated into the present County Road system that were constructed and maintained by a gas and weight tax levied by the State of Michigan. Snow removal began in 1926 when the State Highway Department opened US-131 from Cadillac north to the Straits of Mackinac, also known as the Mackinac Trail. It was not until later when the Kalkaska County Road Commission started to plow some of the main roads during the winter months. As time passed, better roads were constructed and more equipment was purchased to give the motoring public an all season highway.